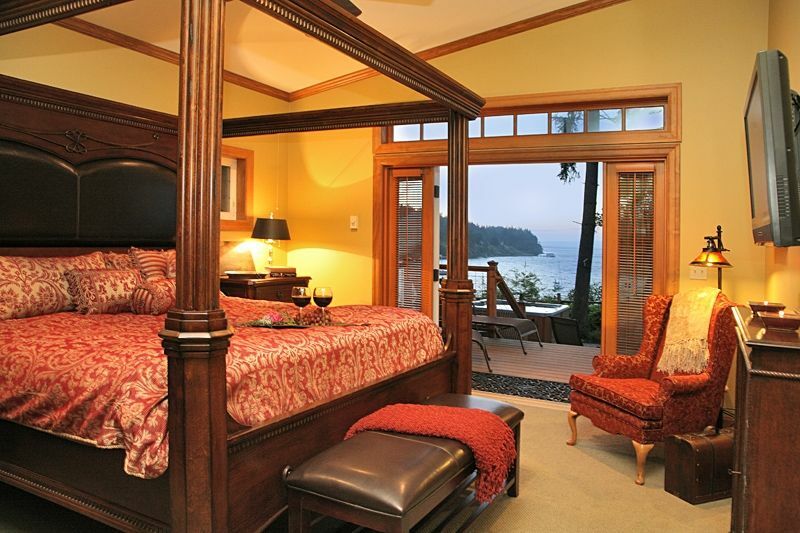 Perched on a bluff overlooking Honeymoon Bay - the brand new Captains Cabin is breathtaking. From the large hot tub overlooking the water, entertainment size decks and courtyards, fireplace, gourmet cherry kitchen, to the amazing master suite with huge four poster bed and private bath with heated stone floor - this home is fantastic. Perched on a bluff with bald eagles around, the Captains Cabin waterfront home commands an enviable perch with a view that goes forever. The entry way is through a vine covered arched trellis opening onto a cobblestone courtyard. Upon entry, you are surrounded by a courtyard filled with the Captains memorabilia, and a wonderful garden, complete with treasures from his years abroad. The stairs lead to a manly entrance flanked by copper drains, and glass lighting from the Far East. The entrance hall is 9 feet high with magnificent art around, including a painting of his fastest clipper ship, the Enlim. Once through, you enter a great room unlike any you have ever seen, with ceilings up to 11 feet. At the heart of it is the Captains old dining table off the HMS Katania, the Captains first command; you’ll spin your own yarns with meals at this beauty. There is a bust of Angel in the main room, the one woman who nurtured the captain through the darkest of days; her best friend, Rebecka, is the high born woman the Captain called his “wench”, his one true love, for whom he built the cottage next door. Of course, Angel is treated to the finest cinema level system, as you will be too. Finally, there are the decks that surround the great room; with a grand view of Honeymoon Bay, the Captains bay. The guest VIP, with vaulted ceilings, has French doors to its own deck and afternoon courtyard, as does the den; all with the finest electronics for personal entertainment. The Captains bedroom is a magnificent affair, with the center bed a four posted gift from Prince Sulawi, whom the Captain saved from pirates near Mindanao. The Armoir is one of the finest pieces of antique French walnut furniture of its kind, a gift of gratitude from Madame DuClair. Of course, his room opens onto the same magnificent view; watch it changes as the sun moves across the sky. On the water side there is a wonderful cobble courtyard. Follow a brief path out to the bluff watch where the Captain took his morning chicory, an exotic brew whose recipe was never divulged, even to the Wench. This wonderful spot is has a natural cabana of evergreens and Madrona’s...there is something magical and inspirational about this little setting, so unique and picturesque. This place was perfect for our group. It was beautiful inside and out. Beautiful waterfront home, spacious with great views. Perfect spot to gather for my son's wedding. What a mistake! Originally I had reserved this home which the property manager had canceled by mistake, and without notification. After an anxious and upsetting afternoon not knowing how things would be resolved, on the day before check-in, she finally got back to me at 7 PM to let me know she could put me in a different house. "Dad'sCabin". It had a lovely kitchen and huge table which was great for finishing the wedding cake I had baked. We also loved the huge TV and I especially liked the warm floors in the bathroom. The deck and the hot tub were also quite nice. I'm sure in the long run it was indeed a bigger and better house then what we had originally reserved and it was decent that she didn't charge the additional cost. But honestly after the panic attack that I suffered I felt it was the least she could do. It was such an unnerving experience I don't think I will be able to use this company again in the future. We had such a marvelous time at the Captains Cabin! We came to the island to celebrate Thanksgiving with my son and his wife and baby and just wanted to get away from the regular mess of every day life. The Captains Cabin was just so much fun. We loved the hot tub and the views were wonderful. It was very cold outside, but we enjoyed Whidbey anyway. The house was very clean and had everything we needed for our wonderful meal. The house is even nicer than the photos.